Brock Lesnar has been unleashed nine times since returning to the WWE at Extreme Rules 2012. Now that the sample size has increased, I thought it would be interesting to take a look back at the former UFC champion’s body of work and see where his matches rank. Today we countdown the best of Brock’s second tour of duty! I have to say that I think Brock has far exceeded any in-ring expectations placed on him since returning. Many presumed that Brock would “dog” it and go through the motions to get his pay day. That has not been the case at all. Brock has wrestled every match like it was his last and has put together one of the most impressive string of bouts ever seen from a guy who missed a decade in a WWE ring. I thought it would be fun to look back at Brock’s current run and rank his top matches. As always, this list is subjective and it is simply a matter of my opinion. My tastes likely vary from yours so we won’t agree on everything. If you think I missed out on one, let me know and leave me a comment. With that said, let’s take a look at the best from the beast incarnate starting at the top. Brock Lesnar vs. John Cena No Holds Barred Match (Extreme Rules 2012) – Two plus years later and this match still holds up today. I would dare say that this may be Cena’s greatest WWE match. I don’t know if it was the hype, the intrigue, or just the excitement of seeing Brock back but this worked on every level. The match played out exactly as you’d expect a match between a former UFC fighter against an experienced WWE wrestler. It was one of the most brutal matches of either man’s careers and blew away Brock’s other eight matches. I know Cena won and I know that tarnished the match for some, but for me it doesn’t get any better than this 2012 classic. Brock Lesnar vs. CM Punk No DQ Match (SummerSlam 2013) – I don’t think that this match gets the due it deserves. I even went back and forth briefly after watching it again as to whether this was number one or the Extreme Rules match. The match told a great story and Punk and Brock clicked immediately. Punk going submission for submission with Brock was something different as Punk (unlike Cena and Hunter) had a repertoire of submission moves he was known for. I am not a big Punk fan but he was fantastic here. The WWE talent reportedly gave these two a standing ovation when they got to the back, which was well deserved. Brock Lesnar vs. Triple H NHB Match (WrestleMania 29) – This was a lot like the Undertaker match in that they worked a slower, more physical style but it was more entertaining in my opinion. They spent the early part of the match outside of the ring. Lesnar dominated the mid part of the match. Lesnar knocked Shawn Michaels off the apron with an elbow at one point. Michaels came back at him and took an F5. Brock kicked out of a Pedigree right after. Hunter brought the sledgehammer in the ring. Lesnar F5’d him and Hunter kicked out. Lesnar had a bloody lip at this point. Brock looked jacked by the way. The match had a similar psychology to The Undertaker vs. Triple H matches with Brock playing the part of Trips. Triple H finally regained the advantage and slammed a chair into Lesnar’s arm twice. Triple H got the kimura. Heyman tried to interfere but got kicked by Michaels. Brock finally powered his way out but wound up taking a DDT into the steel steps. Hunter nailed Brock in the head with the sledgehammer. Trips followed up with a Pedigree onto the steps for the three count. Brock Lesnar vs. John Cena (Night of Champions 2014) – This was a fun match that probably isn’t getting as much credit as it should. They played off of their SummerSlam match with Cena getting more offense in than previously. Why this changed who knows? It wasn’t quite the back and forth match that their Extreme Rules match was but it was entertaining nonetheless. Seth Rollins attacked Cena giving Brock the DQ win. The fans were into it, I was into it, and this was a real fun match. Brock Lesnar vs. Triple H (SummerSlam 2012) – This was Lesnar’s second match back and didn’t have nearly the anticipation that the first one did. It was more or less a glorified squash although Hunter certainly got his offense in. I just don’t think fans cared about seeing Hunter as a babyface at that point against Brock. Hunter played up Brock’s previous injuries and worked on Brock’s stomach but the match was all about Brock breaking Hunter’s arm. Lesnar gets his first win here and even got to kick out of the pedigree to boot. Brock Lesnar vs. The Big Show (Royal Rumble 2014) – There wasn’t a whole lot to this match. This one was a good old fashioned squash match. The match was wrestled in the same dominant way that the Lesnar vs. Cena match was wrestled except this one was shorter and to the point. This is exactly how it should have been and the match was short enough that fans were into it from start to finish. It’s probably Lesnar’s least memorable match but one of his most entertaining in my opinion. Brock Lesnar vs. Triple H Steel Cage Match (Extreme Rules 2013) – Hunter brutalized Lesnar’s knee with the chair. The announcers certainly went out of their way to give Lesnar sympathy, setting up the babyface turn. Heyman came into the cage at one point and was pedigreed. Hunter pedigreed Brock immediately thereafter who kicked out at 2 ½ for a near finish. Hunter got his hands on a sledgehammer and went to use it before Heyman gave Triple H a low blow. Lesnar wound up using the sledgehammer on Triple H and KO’ing him. Lesnar than F5’d Triple H and pinned him. It wasn’t a bad match but highly disappointing in regards to how it was built up. It was promoted as an “old school” cage match which to me meant blood and brutality. Was it brutal? Maybe, but it certainly wasn’t bloody. Brock Lesnar vs. The Undertaker (WrestleMania 30) – The end of the streak! Brock worked the leg for most of the match to the dismay of a bored Superdome. The match had a slow, methodical, old school pace. Taker later kicked out of the F5 and Lesnar broke Hell’s Gate twice. Nobody in the crowd believed Lesnar was winning. The match didn’t have the same emotion from the crowd as the last several Taker Mania matches which made the finish here even more memorable. Lesnar pinned Taker after reversing a tombstone attempt into a third F5 and the crowd was stunned silent. The reaction from the crowd however was one of the best reactions I have ever seen in modern day wrestling. 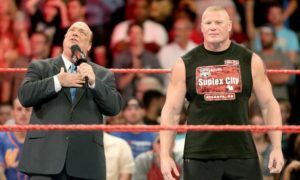 Brock Lesnar vs. John Cena (SummerSlam 2014) – It is hard to rank a one-sided 20 minute+ squash match higher than any of the other matches on this list. I certainly can appreciate what they were trying to do but let’s face it. In hindsight the match was a waste of time and made no sense. This was a different match. The booking of Lesnar was brilliant and the match will probably age better than you think. I just can’t imagine Lesnar having any more matches on this run as dull as this one. It was certainly intense yet not very entertaining at all.